Filming of “Black Mass’’ around Water Street in Dorchester Monday. Security was tight on the Dorchester set of “Black Mass” on Monday afternoon, but we did manage to catch a glimpse of a bloodied actor and another man in jeans who appeared to be the stand-in for Johnny Depp, who plays Whitey Bulger in the movie. 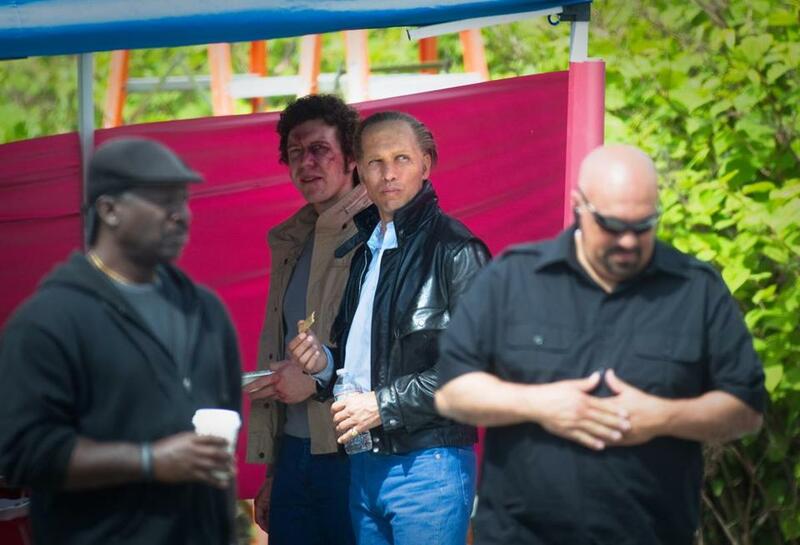 (Depp was wearing an almost identical outfit when he started shooting last week.) “Black Mass” is being directed by Scott Cooper, whose credits include “Crazy Heart” and “Out of the Furnace.” . . . Rage Against the Machine guitarist Tom Morello, wrapping up a tour with Bruce Springsteen, tweeted that every member of his Harvard band the Deviants was at the Boss’s show at Mohegan Sun over the weekend. . . . Actress Patricia Richardson, from the sitcom “Home Improvement,” dined with friends at Ken Oringer’s Clio. . . . On his way out of town after speaking at the Merrimack College commencement, “It’s Always Sunny in Philadelphia” actor Charlie Day stopped into Legal C Bar at Logan for a St. Pauli Girl and the spicy fish ’n’ chips.